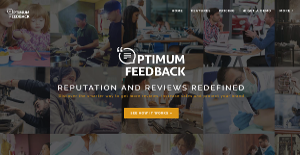 Optimum Feedback is a brand management application that allows businesses to monitor reviews and mentions of their brands, products, and services from online conversations, forums, social media posts, and more. Aside from comments and mentions about your brand, Optimum Feedback also gathers and analyzes reviews and mentions of your competitors, see where they are excelling and underperforming and take full advantage of the information by creating campaigns, engagement strategies, and more that will improve your brand’s standing and increase natural, positive reviews. With Optimum Feedback, you will know almost immediately how your clients feel about your product or service right after the transaction. This provides you insights on how their experience went, what makes them satisfied (or dissatisfied) with your offerings, and more. From there, you can identify the strengths of your products as well as areas where you need to work on. Optimum Feedback also helps you rescue your unhappy customers and prevent them from publicly posting negative feedbacks about your business. Optimum Feedback automates the review solicitation process, using state of the art technology to analyze and decide when is the best time to ask feedback from your customers. With the feedback cycle fully automated, getting both positive and negative comments, suggestions, and more from your clients is significantly shortened. That means you can quickly determine issues and act immediately to address them, resolve problems, and provide customers with a better brand experience. It is essential that you immediate identify changes in customer behavior and trends. Optimum Feedback gives you first-hand information how your customers value your business over any length of time according to tangible consumer indicators. You can set achievable targets for your managers based on customer feedback and satisfaction. Ensuring that customers are satisfied with your business and remain that way is one effective means of generating genuine positive reviews. Optimum Feedback helps you determine what makes your customers tick so that you increase your chance of getting authentic reviews from them without having to resort to providing incentives such as discounts and giveaways. Optimum Feedback delivers real-time alerts whenever someone mentions your company, brand, product, or service in a bad light. You can configure your alerts and receive them via SMS, emails, and calls. You can also include specific team members to receive instant updates whenever a negative mention surfaces. What Problems Will Optimum Feedback Solve? With over 84% of US adults trusting online reviews as much as a personal recommendation, reviews are quickly becoming the one thing that separates profitable businesses from those fighting an uphill battle. Negative reviews can quickly kill a business, and Optimum not only makes sure businesses stay on top of their reviews by providing easy live monitoring across tens of review platforms but more importantly, it helps businesses get MORE reviews by ‘smart-targeting’ their customers and making it easy for them to leave a review when they’re most likely to do so. Every enterprise has its own characteristics, and may require a specific CRM Software solution that will be designed for their business size, type of customers and staff and even particular niche they deal with. It's not wise to count on getting an ideal app that will be suitable for every business no matter what their history is. It may be a good idea to read a few Optimum Feedback reviews first and even then you should keep in mind what the software is intended to do for your company and your workers. Do you need an easy and straightforward solution with just basic features? Will you actually use the advanced tools required by pros and large enterprises? Are there any specific features that are especially practical for the industry you work in? If you ask yourself these questions it will be much easier to locate a solid solution that will fit your budget. How Much Does Optimum Feedback Cost? We realize that when you make a decision to buy Feedback & Reviews Management Software it’s important not only to see how experts evaluate it in their reviews, but also to find out if the real people and companies that buy it are actually satisfied with the product. That’s why we’ve created our behavior-based Customer Satisfaction Algorithm™ that gathers customer reviews, comments and Optimum Feedback reviews across a wide range of social media sites. The data is then presented in an easy to digest form showing how many people had positive and negative experience with Optimum Feedback. With that information at hand you should be equipped to make an informed buying decision that you won’t regret. What are Optimum Feedback pricing details? What integrations are available for Optimum Feedback? If you need more information about Optimum Feedback or you simply have a question let us know what you need and we’ll forward your request directly to the vendor.